Looking for relief from headache & migraine pain? Stop headache pain fast with acupuncture. Are you struggling to get through the work day because you have another headache? Do you have pain one or more days per week? When asked how often a headache is occurring patients will often say ‘the usual’ – which for many – is several times a week. For some it’s even daily! Headache sufferers are often prescribed medications only to find their headaches increasing in frequency or intensity over the years. But it doesn’t have to be this way! Acupuncture can help! Most of my patients report a reduction or elimination of their headaches within 5 treatments or less. How Does Acupuncture Relieve Headaches & Migraines? Acupuncture works with the energy anatomy – also called the meridians system. 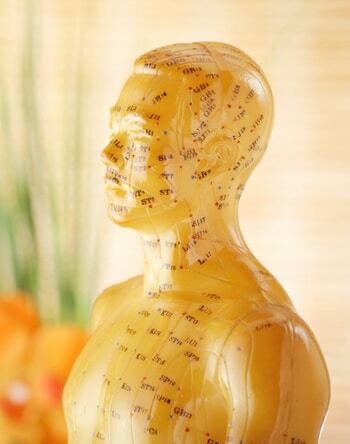 Similar to the way your blood vessels circulate blood, acupuncture meridians are channels that carry life force or ‘qi’. In the photo of the acupuncture model on the right, meridians are depicted by the lines and acupuncture points are represented by the numbers. Notice how many acupuncture points there are in the head area? This is because a lot of energy flows upward towards the top of the body where it can become stuck due to tension or blockage. The acupuncture channels of your head flow into your arms and legs. Using points below the elbows and knees where the energy is most accessible, we are able to open the channels in your head to create more flow. Freeing the energy flow stops pain. From a western medicine standpoint – research demonstrates that acupuncture is known to stimulate certain brain chemicals responsible for pain relief. There are many types of headaches and various triggers for headaches but headache pain is – well – a pain! According to Web MD – “About 30%-80% of the adult U.S. population suffers from occasional tension headaches; approximately 3% suffer from chronic daily tension headaches. Women are twice as likely to suffer from tension-type headaches as men”. Symptoms include increasing muscle tension, headaches that occur later in the day, with pain present much of the day increasing in intensity as the day wears on. Triggers for tension headache include inadequate rest, emotional or mental stress, depression and anxiety. Sinuses are air-filled cavities (spaces) located in your forehead, cheekbones, and behind the bridge of your nose. When sinuses becomes inflamed there is swelling and increased mucus production eventually causing the channels to become blocked. The increased pressure in the sinuses causes a pain similar to that of a headache. Sinus headache symptoms include deep, constant pain, – usually facial – in the cheekbones, forehead, and bridge of the nose. Your sinuses may be blocked or there may be sinus drainage, sometimes with post nasal drip that is thick and sticky. Clogged ears and ear popping sensation with pressure are common. Did you know that Chinese medicine suggests that common American food choices cause an excess of mucus? Mucus causing foods include wheat, dairy, sugar, and cold raw foods such as an excess of fruit and salad in the diet. Dairy products are especially mucus producing! Chinese medicine recommendations on diet may surprise you! Most people with migraines have tried several medications by the time they try acupuncture. Many of my patients with migraines have had the symptoms for years. Migraines may come on suddenly but are usually preceded by a key set of classic migraine symptoms including visual disturbances, an ‘aura’, or neck tension prior to becoming severe. Patients take medication at the first sign and can usually prevent a full blown migraine. But the migraines seem to return again and again, interrupting daily living. Acupuncture helps migraines! Even migraines that are accompanied by nausea/vomiting and sensitivity to light and sound are relieved with acupuncture. No matter the type of headache – sinus headache, tension headache, or migraines – call me. I have treated hundreds of patient for headache pain who now live pain free lives. KC – Pottstown, PAAfter 3 treatments I Was Headache Free For the First Time in Weeks! Kelly A. – Downingtown, PAShe treated me 5 times in a 3 week span, and I have gone nearly 6 months without a migraine!